While other major world cities claim bragging rights to” bigger, better, bests,” NYC is tough to beat. It’s the center of global commerce and culture, and it stands as a symbol of American ingenuity, inclusiveness and resilience. 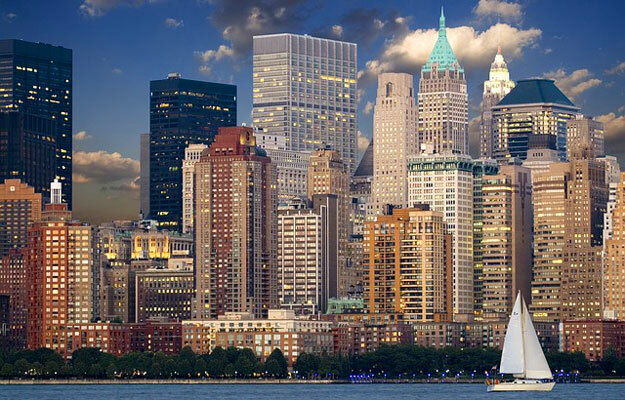 A favored and often first U.S. destination of visitors from all over the globe, NYC is in the minds of many Americans. 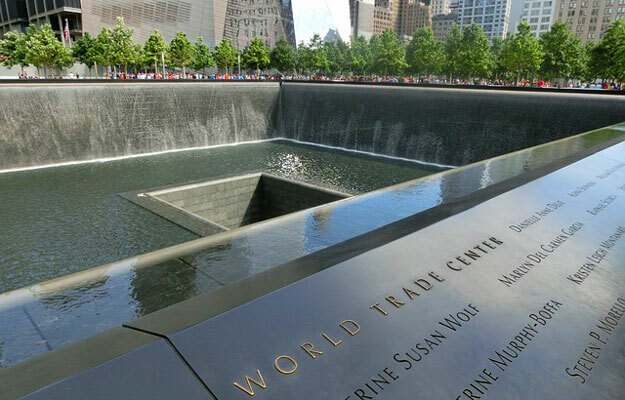 One of the most profoundly moving experiences anywhere is the Memorial to all those who perished in the horrific events of September 11. It sears the reality of the seismic shift in global dynamics in the mind of everyone who visits. While people from all over the world watched TV footage and photos in disbelief as the horror of that day unfolded, standing in the large empty space left among skyscrapers, a hole is felt in the human spirit. In its simplicity and symbolism, the Memorial holds a powerful weight. A place of remembrance and quiet reflection, it is both a tribute to the past and a place of hope for the future. Grasping the symbolism of the square memorial pool and waterfall wall etched with the names of those lost is overwhelming. The Museum guided Memorial tour explores the symbolism behind its design and the significance of the World Trade Center. Inside the Museum adjacent to the Memorial are interesting and moving exhibits, films, tours and programs honor the lost while focusing on rebirth through knowledge and understanding. Tickets are required to enter the Museum. The Met – a singular name speaks to its iconic status and brings one image to mind: the most expansive and diverse collection of the best art in the world. The 1.6 million square feet museum is so magnificent and has collections spanning over 5,000 years of art beautifully curated in extensive galleries. The depth and breath of its holdings have, in the words of former director, Philippe de Montebellow, “every category of art in every known medium from every part of the world during every epoch of recorded time.” Expect to see masterworks in every art form from ancient to modern and contemporary to Egyptian funerary art, ancient Greek sculptures and a perfectly preserved room from a villa just outside Pompeii. Complete period rooms in palatial places as Versailles; carved wood canoes from Papua, New Guinea; European masters spanning centuries: Rembrandt, Velazquez, Vermeer, Van Gogh, Goya, Manet, Monet, Degas, and the list of greats goes on. The American Collection is the largest in the world. Galleries are filled with the beauty of musical instruments; decorative arts; arms and armament; religious artifacts with a global reach; clothing design, photography, and ever so much more. Many cities around the world have beautiful parks, but only NYC has Central Park. A huge swath of green in the middle of Manhattan – it’s arguably the world’s most famous city park. Walk through it, bike through it, Segway through it. Put out a blanket on expansive, bucolic Sheep’s Meadow for a spectacular view of Manhattan’s skyline all around. Rent a rowboat and row out on The Lake or overlook it over lunch in the Boathouse cafe. Walk through the Conservatory Garden, six acres of formal gardens. Stroll down shaded paths, over stone bridges, past statues, around ponds surrounded by weeping willows and flowering landscape. Take photos of stone arches crossing lovely ponds, of whimsical Belvedere Castle, of flowers and quotations from the Bard in Shakespeare Garden, of Strawberry Fields, the tribute to John Lennon who lived in the Dakota house across the street. Take the kids to the zoo. In the winter, skate in Wollman Rink, ride in a horse-drawn carriage, have lunch or dinner at Tavern on the Green, aglow with thousands of mini white lights – straight out of Curry & Ives. 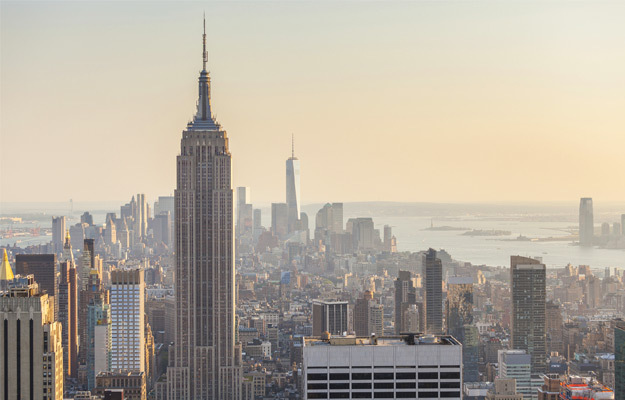 Today there are taller skyscrapers in the world, but none is more iconic than this signature Art Deco landmark – The Empire State Building. In the 1930s, a time in which constructing commercial buildings that reached up into the sky was a competitive race, the Empire State Building held the honor as the tallest skyscraper in the world, a place it held from the time it was completed in 1931 until it was bested in 1972 by the World Trade Center. In the race to be first, the 1453 foot high Empire State Building was built in the short span of 15 months! To accomplish this feat, it took 3,400 workers to build the 102 floors, install over 6000 windows and 73 elevators working at warp speed. While others may be taller and sleeker now, there is a special aura about this clean-lined limestone-paneled Art Deco structure, recognized at first sight by millions. The 102nd floor Top Deck is also open to the public, accessible by a manual elevator. From both decks, the views of the city spread out way below and spreading in the far distance are spectacular. Singularly recognized world-wide as a touchstone of universal freedom and democracy, the Lady Liberty is a sight to see up close. Her imposing, enduring, unflinching presence has dominated New York Harbor since her dedication on October 28, 1886. Standing as a guardian of liberty, she can be seen from Battery Park, from the Staten Island Ferry, or on a tour of Liberty Island. To get to the island, make reservations ahead of time. To get up to the pedestal or to the crown, reservations must be made way in advance. Information on tours and ferry service from Battery Park on Statue Cruises is readily available on the National Park Services website. It is possible to walk the grounds without reserving Pedestal or Crown access, but, if you are going to take the time to stand in lines and go through 2 security checks to get to the island, going up to the pedestal and the crown makes it a once-in-a –lifetime experience. Unique as a symbol of the promise, hope and possibility of America, Ellis Island is compelling. Statistics tell the immigrant story from 1892 to 1954 when the primary point of entry was NYC: a staggering 12 million immigrants passed through Ellis Island! A visit to this “Island of Hope, Island of Tears” offers a compelling, very real, insight into the fears and hopes of immigrants who left everything familiar behind for the sake of a better life. To get there, Ellis Island access and the ferry ride to it are included in all ticket options for a visit to the Statue of Liberty. Once there there are options. Free audio tours are available for self-guided tours; free 30 minute guided walks are offered if staff is available; 90 minute guided tours of select areas offered by advance reservation only for anyone over age 13. While many artifacts have been in storage since Hurricane Sandy, life-sized photographs of families who passed through over the years on exhibit throughout the halls are thought-provoking. For those whose families passed through, the experience is profound. If you know your ancestors passed through Ellis Island, bring along their correct full name and any documentation you have to look them up on computers available for searches. If they are there, you will be able to find their names on the memory wall. The experience is humbling and grounding. A fascinating time capsule of immigrant life in America between 1863 and 1935, this interpretive museum is a fascinating, one-of-a-kind hidden gem. Located in the Lower East Side, America’s iconic immigrant neighborhood, the museum interprets the daily lives and personal journeys of generations of ordinary working-class people in a humanizing way. Over a span of 67 years, the 1863 tenement building at 97 Orchard Street was home to nearly 7,000 working class immigrants from over 20 countries. They came in waves, fleeing wars, famine and persecution – German, Polish, Irish, Italian, Jewish, Russian. The museum tells the stories of how newly families settled in this immigrant enclave, established themselves, adjusted to an ever changing neighborhood, and then left to all points throughout America to follow the American Dream. Tour options give visitors a close-up view of the daily lives of residents both in the tenement and in the ever-evolving neighborhood. Tours of the building include restored apartments, each furnished in amazing detail, reflecting a specific time and immigrant group it represents times, and street-level, family businesses. Costumed interpreters take tours to another level as they play the role of residents in an engaging and interactive way. A collection of the best of the bests of modern and contemporary art in the world line MoMA’s open, light-filled galleries. While not as huge and iconic as the MET, the MoMA is about the art of our time. Modern and contemporary art stretches the boundaries of art as we are uses to seeing it through the ages. It challenges our notion of what is art. When viewing awesome, now-familiar works in MoMA’s permanent holdings from the greats – Picasso, Matisse, Van Gogh, Gaugin, Dali. Pollock, Mondrian, Klee – it’s easy to forget that their art was considered to be outrageous and experimental in their time! Contemporary installations give voice to the new wave of artists. Often difficult to understand at first glance, they challenge the mind by bending artistic norms. This is the essence of this great art museum. Don’t miss the Sculpture Garden. 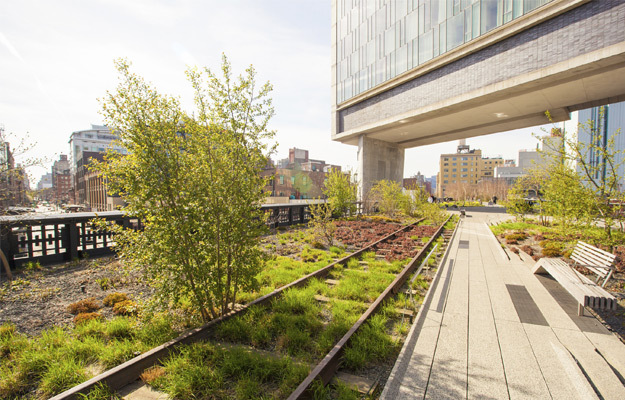 This 1.4 mile public walkway park, elevated 30 feet above the hustle and bustle of Manhattan’s West Side from Gransevoort St. in the Meatpacking District to West 34th Street between 10th and 12th is a one-of-a-kind experience. Transformed from an out-of-use freight rail line a into a true community place, it’s filled with a landscape of trees, bushes, grasses and flowering perennials, benches on which to sit and chill, art, food vendors and views! Used by residents of the surrounding neighborhoods, it is a great place for visitors too. On-going community programs, over 400 programs of them are inclusive gatherings -historical tours, kids activities, art projects, dance parties, you name it, they do it! For visitors, it’s a really cool. It’s a place to get a real feel of NYC and New Yorkers. There are great theaters and theater districts throughout the world, but there is only one Broadway. And, because NYC is the birthplace of musical theater, attending a Broadway show, especially a musical, is uniquely New York. From golden age of Rodgers and Hammerstein greats – South Pacific, Oklahoma, The King & I – to familiar hits,Jesus Christ Superstar, The Book of Mormon, Wicked, Rent, Lion King, Cats, Hair, Chicago, Fiddler on the Roof, to the latest, sold-out-for-months phenom, Hamilton, Broadway’s colorful marquees draw amazing talent and rousing crowds.